The Passionate Foodie: Rant: Do We Need a Super-Sized Soup Dumpling? 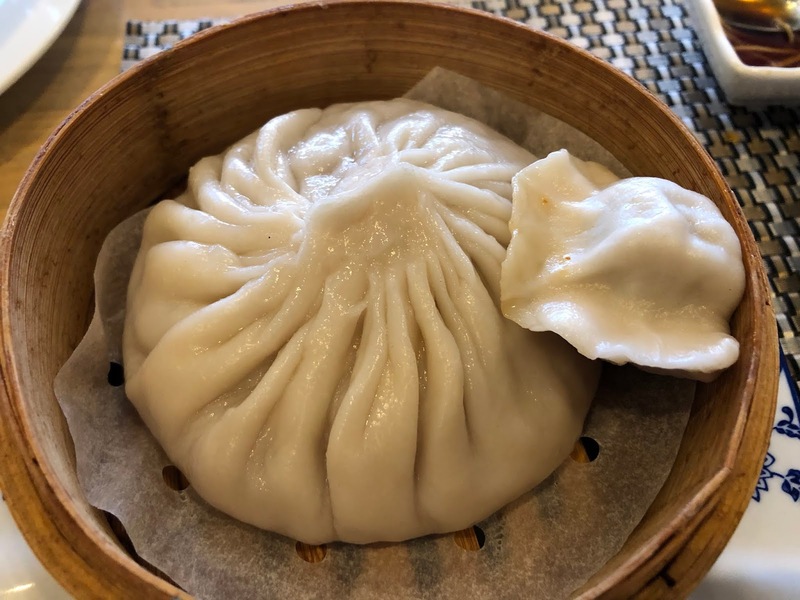 Rant: Do We Need a Super-Sized Soup Dumpling? Sometimes a food dish sounds incredibly cool, but when you actually eat it, the dish loses some of its luster. Xiao long translates literally as "small, steaming basket" while bao, or more properly baozi, are "steamed buns." These dumplings are commonly steamed in small bamboo baskets, so the name is fairly literal. The dumplings are usually made with unraised flour, making them smooth and partially translucent. They are traditionally filled with pork, but other ingredients can also be used, everything from beef to seafood. 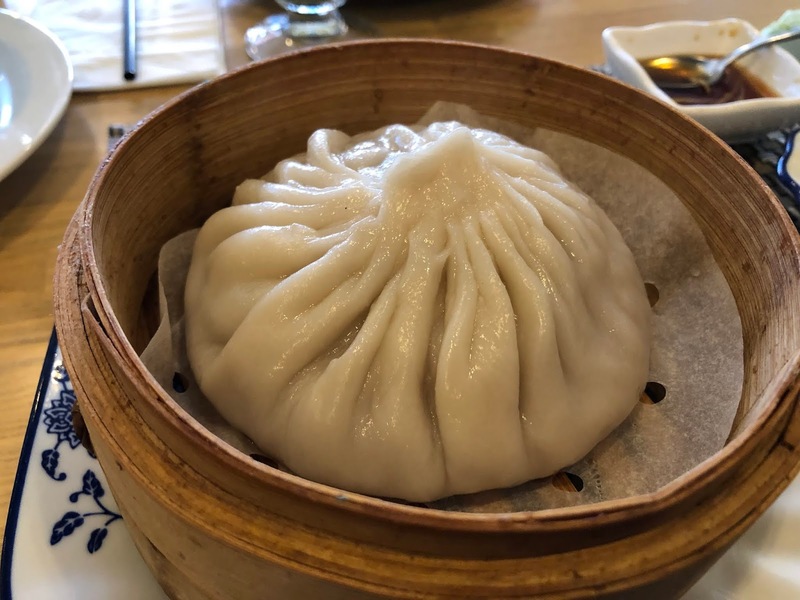 What primarily differentiates soup dumplings from other types of dumplings is that they contain a broth within the wrapper. Meat gelatin is placed inside the dumpling, and it melts when the dumpling is steamed, creating a savory broth. The traditional dipping sauce is Chinkiang vinegar, a black rice vinegar, with ginger slivers, that possesses a rich, smoky flavor. Though it first opened around April 2017, District Kitchen, an Asian restaurant in Malden, had a grand re-opening in September 2018, which included a number of menu changes. District Kitchen is connected to All Seasons Table, another Asian restaurant in Malden (which is one of my favorites). 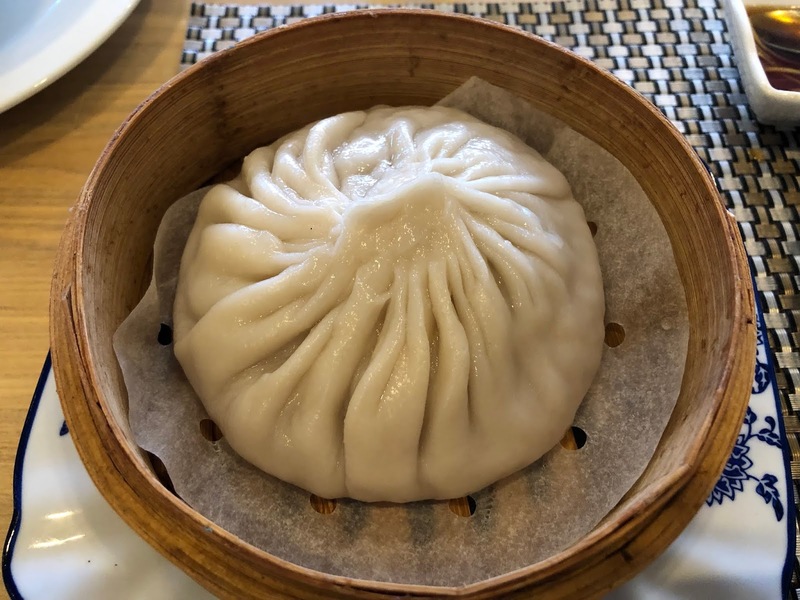 With their new menu, they have been offering a super-sized xiao long bao, which certainly sounds intriguing but is it as good as it sounds? 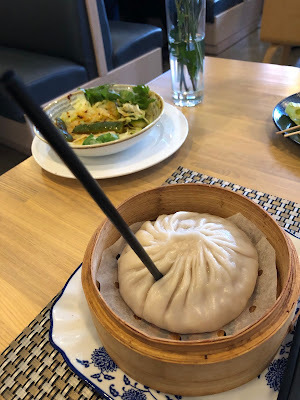 I stopped by District Kitchen for lunch and found their menu has normal-sized soup dumplings listed as "Juicy Pork Bun Dumplings" (6 for $8), as well as the super-sized version, "Juicy Pork & Shrimp Bun Dumplings (1 for $8). I ordered the super-sized version, which you can view in the above two photos. It looks appealing and you get some sense of its size. To truly understand the size of this soup dumpling though, you can see in the above photo how it compares to a regular-sized pork dumpling (not a soup dumpling). It looks impressive, though also a little bit intimidating. They supply you with a straw so you can carefully pierce the dumpling skin and drink the hot broth within, being careful as that broth is very hot when it first arrives at your table. I very much enjoyed the broth, a complex and flavorful soup, and I needed to move the straw around the inside of the dumpling to ensure I got all of the broth. However, once the broth was gone, how was I going to eat the dumpling? With normal-sized soup dumplings, you are given a spoon and chopsticks, sufficient for eating them. You use the chopsticks to place the dumpling on the spoon, and once you finish the broth, it is easy to eat the dimpling skin and meat/seafood inside. With the super-sized dumpling, I only had a pair of chopsticks. I would have needed a soup ladle or spatula to pick up and hold this huge dumpling, but neither was provided. It isn't really finger food, and it is too large to pick up fully with your chop sticks. You have to lift part of it out of the bamboo steamer and bite that section. This is not an ideal way to eat a dumpling and it wasn't easy to get a proportionate amount of dumpling skins and meat/seafood in a single bite. In addition, the dumpling skin at the top of the dumpling was a bit thicker than normal, making it a more chewy, though the bottom of the dumpling skin was thinner. The taste was there, with a delightful meaty center, but the difficulty of eating this super-sized dumpling made the experience less than impressive. Sure, it was fun to try this huge xiao long bao but I wouldn't order it again. I'd get the normal-sized soup dumplings instead. This is a cool idea which fails in the execution, being too difficult to eat properly. And as a brief aside, I enjoyed the other dishes I ate at District Kitchen and I will be returning soon to check out more of their menu. Overall, my lunch experience was very good and it is worth checking out District Kitchen. Rant: Does A Restaurant Need A Liquor License? Happy New Year: Welcome 2019!